This is my 700th post! It boggles the mind! I should make it very clever and funny and memorable, but I’m not feeling very organized in my mind at the moment, so none of that is going to happen. Instead you’ll get a ramble from my melty brain, and it will start this way: “I’ve been thinking about this a lot lately…” As you may have noticed, I’ve been reading some Camus, specifically essays he wrote for Combat magazine as the second world war came to a close and the occupation ended. He’s so hopeful and passionate about starting fresh, about creating a new society, and he’s sorting through his ideas about politics, religion, violence, life and death. It’s an inspiring read, and it’s fascinating to see how his convictions change in response to the world around him. He starts one essay, “We are often asked: ‘what do you want?’ We like this question because it is direct. We must answer it with directness…by returning to the question again and again, we will give our answer clarity.” I love this about Camus! His answer is not entirely specific or practical, but it’s about justice and freedom and purity, and how those can probably never be achieved but they’re still worth fighting for. I’m not often asked “What do you want?” and I’m fine with that, because honestly I don’t want all that much, but I’ve been thinking about my defense of the ordinary, lately, and I have a lot of questions I return to again and again. For instance, I recently described the British kitchen sink films as Ordinary. They are about ordinary people, but they’re also about miserable people, who are trapped by an immoveable class system. And this is not something I would champion. I would not tell someone trapped in an unrewarding hopeless job, “Ah, just make the best of it and think interesting thoughts.” I would encourage them to make a change in their life, and I would hope they’d have the freedom and support to do so. But this is how the cycle continues…their new, more interesting job would become ordinary, and that would be a good thing. Because everybody lives day to day. You could have the most fabulous life imaginable, but you still live it one day at a time, you still move through it from meal to meal and sleep to sleep, from season to season: the sun still rises and sets on you. This is something we all share, and which we can’t escape. This passage through time, with it’s oddly variable, inevitable pace should join us in sympathy with everybody around us, because it makes us all equal, it makes us all Ordinary. But it also makes ordinariness unspeakably precious and not something we should feel stuck with, but something we should value and keep. I want to see a change in the world, I want to see a (peaceful) revolution that brings about the sort of justice in which everybody has the freedom to live their everyday life exactly as they would wish, with plenty and safety and inspiration. The tedious jobs should be shared by everybody, so that we all have the time to be creative and joyful. So that as we’re all stuck on this journey together at the same absurd pace, we all have a beautiful view out the window. Well, it’s 100 degrees and I’m probably not making sense, but by returning to the question again and again, we will give our answer clarity. This is all from the farm! Potatoes, herbs, tomatoes, fennel. I wanted to put it all together with the smallest amount of heat possible. So I cut the tomatoes very thin and cooked them quickly. And I sauteed the fennel and herbs. But beyond that it’s all made (quickly) in the toaster oven. You could use the regular oven and broil it, and everything would be cooked in about ten minutes, so it wouldn’t be hot for very long. It’s kind of like a pizza, except that it’s gluten free! The boys liked it, and so did we. Here’s Our House, by Madness, because somebody was listening to it as I walked down the street earlier, and I remembered how much I like it, and it’s very cheerfully about ordinary life. Slice the potatoes very thinly. I used a food processor, but you could chop them with a knife as well. Put in a big pot with water to cover by about 2 inches. Bring to a boil, and boil until just tender, 8 – 10 minutes. Drain well. 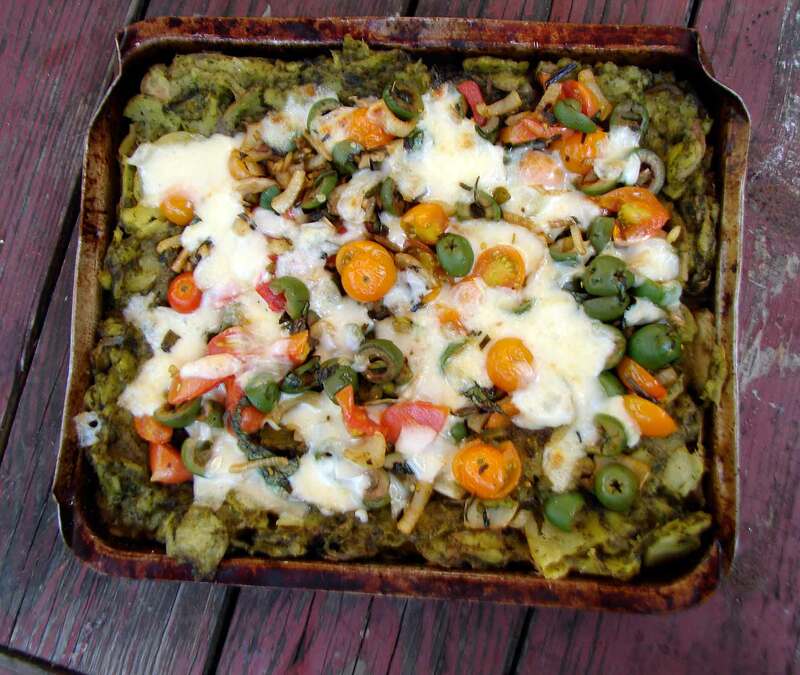 Mix with the pesto sauce…don’t worry about smashing some of the potatoes. You’ll have a nice mix of mash and some thin pieces. Lightly oil a small baking tray. Spread the potatoes in the tray in an even layer, building up the edges to make a sort of crust. Toast or broil for about 15 minutes, until the potatoes start to turn golden and crispy on top. Meanwhile, warm the olive oil in a large skillet over medium heat. Add the garlic, chives and herbs. Stir and cook till the garlic starts to brown, about 1 minute. Add the fennel, and continue to cook until it’s soft and starting to brown, 5 – 8 minutes. If the pan dries out, add a splash of wine. When the fennel is just as cooked as you like it, add the olives, stir to warm through, and then remove from the heat. Stir in the tomatoes. Pile the fennel tomato mixture into the potato crust, leaving a border of about 1/2 inch. Sprinkle the mozzarella over the top. Toast or roast until the cheese is melted and bubbly. 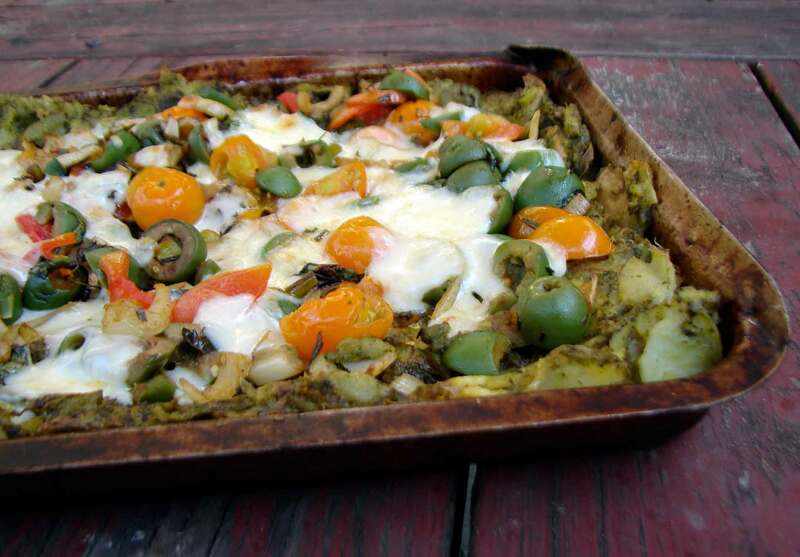 This entry was posted in crust, pie, potatoes, recipe and tagged gluten free pie, gluten free pizza, pesto potatoes, pizza with potato crust, potato crust by Claire. Bookmark the permalink. Congrats! I love potato crusts. Nice that it can be made in the toaster oven too! Happy 700th post! Looking forward to another 700 :)!